Some days you just have to go girly! I took a 9x9" retired Simply Snapshot and cut it down to make two 8x3.5" card fronts. The large peacock image from Cicle of Love fit perfectly in the top section leaving the bottom part open for more decoration or sentiment. 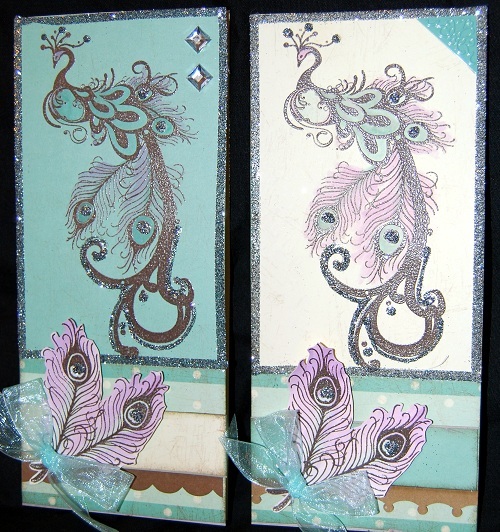 I recently sorted through my cards bins and decided I needed more cards that were blank that I can just stamp an appropriate sentiment into to fit the occassion so I made a pair of feathers to decorate the front. The peacock image is embossed in Cocoa embossing powder. I then came in with my Waterbrush and used ink from the top of my inkpads to add a splash of Gypsy and Juniper ink to the image. I love the softness this gives! I finished it off with a serious amount of bling using Martha Stewart silver glitter. The sparkle frame was made using Scoretape - I simply laid down the lines and sprinkled the glitter on top. The Scoretape does a great job of holding the glitter down (I hate flaky glitter projects that shed glitter after you've make them). 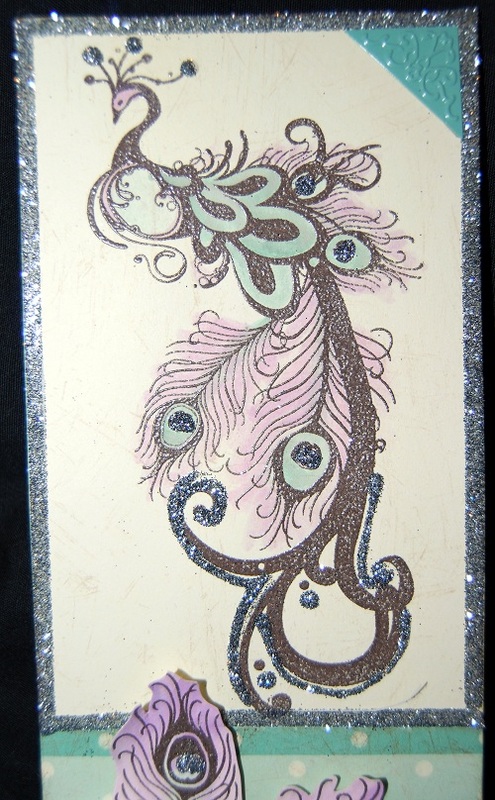 I used liquid glass to free hand outlines and dots on the peacock image and shook glitter over those as well - liquid glass if fabulous for creating this kind of glitter shape and keeps the glitter where it needs to be too!